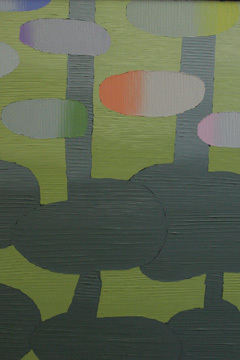 A painting by Harry Tsuchidana. 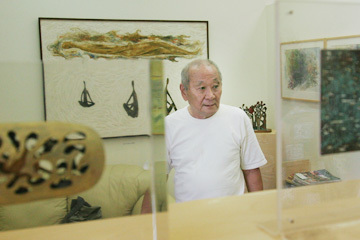 After three years in Kalihi-Palama, Satoru Abe will be closing his art gallery at 888 N. King St., with plans to open at a new location before year's end. Time: Reception 10 a.m. to 2 p.m. Saturday; exhibition runs 10 a.m. to 2 p.m. Mondays to Saturdays, May 6-20. For now he's marking the end of this chapter of his life with a show of works by friends and family. On view will be a rare exhibition of museum-quality work he's amassed over five decades, beginning merely as creations traded among friends like Bumpei Akaji, Jean Charlot, Kim Chung, Isami Doi, Robert Kobayashi, Bob Ochikubo, Jerry Okimoto, Tadashi Sato and Harry Tsuchidana. All were struggling artists who, in ensuing years, would happen to become acclaimed and collectible. Some of the earliest pieces by Doi, whose work influenced a post-World War II generation of Japanese-American artists from Hawaii, date to the 1930s, including wood blocks that have been kept in a safety deposit box until now. It's a collection Abe's passing on to his daughter and son-in-law, Gail and Fred Goto, although Gail says she doesn't think of the art as hers. "I think of it as something my kids will have, because (at 13 and 15) I'm sure they're gonna outlive me," she said. Gail Abe* peers between branches of a chair made by her father, Satoru Abe. Growing up, she tried not to get attached to any work of art because she knew each piece would eventually be sold. "We'd have art all over the place -- in the living room, bedroom, hallway -- sometimes we'd have to stack it. There were times I'd come home and a piece I really liked would be gone because he sold it." Luckily, one of her favorite works by her father, "Me and Three Mourners," remains in the collection and will be in the show. "It's a meditative piece, a contemplation of death, and it's so personal. I think that's why he never sold it," she said. Gail said she didn't gain an appreciation of art's effect on people until she was in her teens. "I was never aware of art as something special or different. It was something that was always there for me. All my friends were the daughters of artists, and in New York they were all struggling. It wasn't as if it was a cool thing to be the daughter of an artist. "It wasn't until we moved back to Hawaii that people would call more, and he would have more exhibitions, but even then he struggled for a long time." 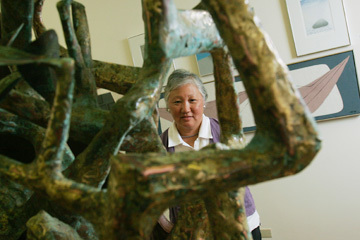 After seeing what her father and late mother, Ruth Abe, whose works are also included in the show, went through, Gail said, "I never wanted to be an artist; it was too much of a struggle, I think." ON VIEW at the show will be a watercolor version of Jean Charlot's "Pahu Drummer," which is on view at the Hawai'i State Art Museum as an oil. Satoru remembers the day Charlot brought the watercolor to him with the intention of trading. "There was a big 500 in back of his, so I guess that was the price. Mine was only worth $125, but he took a nice one. That was from my White Period. Today I would consider our work equal in value." A handful of works are by artists from Hawaii who decided to stay in New York, where they had attended school after World War II. 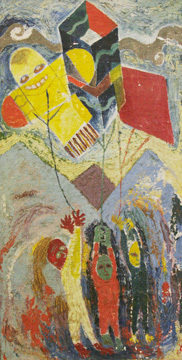 Asked about the title of a piece by one of those artists, Kobayashi, whose early paintings bore traces of Munch and Van Gogh, Abe dubs the work "Kites" on the spot. Few of the artworks to be displayed have formal titles, because, as pioneering artists of the 1950s, Abe and his friends didn't have the marketing savvy of today's artists, or much interest in the importance of documentation. "For us the titles were incidental. Whatever you call it, it's still the same image," said Abe, who will be 80 in June. "Tadashi did a lot of 'Composition 1,' 'Composition 2.' I would do 'One Tree,' 'Two Trees.' Titles didn't matter because I knew where the artist was coming from. "Only recently I feel as though title is kind of important." Behind Satoru Abe is one of his early works, "Me and Three Mourners." » The woman pictured in a story on Gail and Satoru Abe on Page F11 Sunday is Gail Abe. She was misidentified in the caption that appeared with the photo.